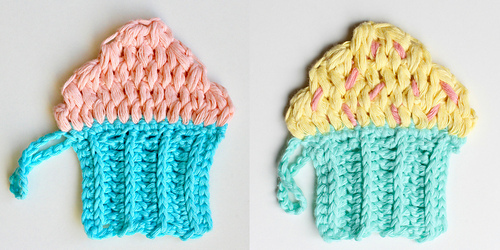 Use your Maker Powers for good by crocheting this yummy Cupcake Face Scrubby and reducing waste. I created this little project for The Hook Nook Life blog and it is quick and fun to whip up for yourself or to give as a gift to make someone else’s day that little bit sweeter. 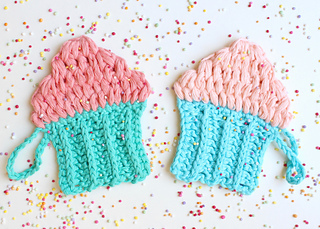 It has a textured scrubby cupcake case to help gently exfoliate and it’s topped with soft squishy frosting to gently clean your skin. Use it to freshen your face up at the end of the day or daily in the shower, either way your bathroom will be brighter with this hanging in there! Are you ready to use your Maker Powers for Good? The pattern includes photos and full descriptions of special stitches as well links to helpful tutorials. Yarn: Approx. 25m (27yards) of worsted weight soft cotton (or other face washer appropriate yarn) in 2 colours, approx.12.5m (13.6 yards) of each colour. 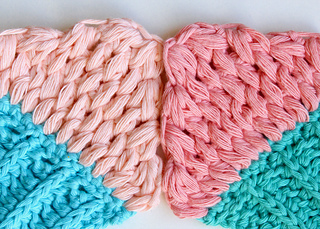 I used Scheepjes Cahlista, 100% cotton, in Tropic & Light Coral and Cyan & Sweet Mandarin. 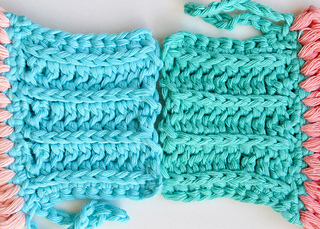 You can use a different weight yarn with an appropriate hook but the finished size will vary. Here are some of the yarns my testers used. Lily Sugar n Cream, Rico Designs - Creative Cotton Aran, Hobby Lobby’s I Love this Cotton, Bendigo Woollen Mills 10ply cotton, Premier Yarns Home Cotton yarn, Drops Loves You 5. Approx. 10cm (4in) wide and 11.5cm (4 1/2in) tall. 6 other photos specific to the cupcake pattern. Links to 2 tutorials and full written instructions for special stitches. Please note that this is a downloadable, printable PDF version of a pattern that is available for free on The Hook Nook Life blog.